So, did you hear the news? Chefs Rachel Yang and Seif Chirchi, owners of Wallingford’s darling Joule, are expecting a baby. No, not that baby. (Their son, Pike Jun Jack Chirchi, arrived in July.) I’m talking about the new kid on the block: their latest effort, Revel, due in December. 401 N. 36th Street, in Fremont: It’s nothing to look at now, but stay tuned. 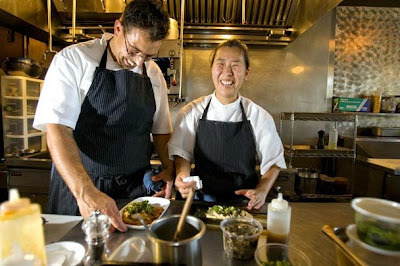 Chefs Seif Cherchi and Rachel Yang, at Joule [Seattle Times photo/Mike Siegel]. Revel is a partnership between Yang and Chirchi and the building’s owners, developers Chad Dale and Bryce Phillips, who helped bring Staple & Fancy Mercantile and The Walrus and the Carpenter to Ballard’s Kolstrand Building. Now under construction on the corner of N. 36th and Phinney (directly across from the colorful Thai restaurant, Kaosamai), this latest restaurant space — with the dining room and kitchen on one side and a 15-seat bar on the other — will soon sport a large warm-weather deck. As a longtime supporter of their work, I’ll be looking forward to the changes to come, knowing that formal or casual, whatever they’re cooking, it’s certain to be delicioso. And I’m not the only one who agrees with that assessment. Outta the mouths of babes. “Delicioso!” says Pike Chirchi.